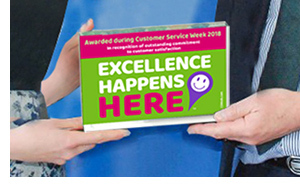 Recognition is an important part of every Customer Service Week celebration. After all, when people know that their efforts are appreciated, it increases self-esteem, job satisfaction, and customer satisfaction. You’ll find details on these and other recognition activities in the Agendas section at CSWeek.com. And while you’re there, be sure to click the Shop button to view all of the decorations, rewards, gifts, and stress relievers that we have for you this year. Order your celebration materials today!